Erich Heckel was born on July 31, 1883, in Döbeln. His interest in and talent for the arts were apparent from an early age. Along with his grammar-school friend and future Brücke colleague, Karl Schmidt-Rottluff, Heckel joined the “Vulkan,” their school’s debating society. The lively society’s anti-bourgeois artistic and literary discussions created a stimulating forum for both teenagers. Nietzsche was discussed with special interest, perhaps leading to Heckel’s and Die Brücke’s later interest in the philosopher and his writings. In 1904, Heckel began his architectural studies at the Polytechnical University in Dresden, where he met fellow architectural student Ernst Ludwig Kirchner. Discovering that they shared similar artistic and philosophical sentiments, Kirchner, Heckel and Schmidt-Rottluff, along with their friend Fritz Bleyl, formed Die Brücke in 1905. The group would later expand to include Otto Mueller, Emil Nolde and Hermann Max Pechstein. Taking inspiration from and linking together art sources as diverse as the European Renaissance (Dürer, Cranach and Grünewald), Jugendstil, tribal and primitive art, Post-Impressionism, Fauvism (Gauguin and Matisse) and Northern European Symbolism (Munch), Die Brücke created a new artistic movement that broke from the traditional, neo-romantic style championed by the German establishment. Emulating the Medieval guilds, this fledgling group of German Expressionists strove to build an artistic community joined by a shared belief in spirituality, creative freedom and harmony with nature. Members often traveled together, seeking out remote locations as untouched as possible by civilization. Together with Kirchner and Pechstein, Heckel spent summers at the North Sea Coast (in 1907 and 1908) and the Moritzburger Lakes (in 1909 and 1910). The desire to capture the immediacy of mood, ambience and setting led Heckel and his Expressionist colleagues to revive the German woodcut tradition, along with other printmaking techniques. A cheap and affordable way to reach the masses, annual print portfolios helped the Brücke artists gain recognition and generate income. Mostly, however, the members’ prints were experimental, and only a few proof impressions, often on special paper, were produced from each plate or stone. The artists pulled their prints themselves (or for one another), eschewing the established printing workshops used by other artists. Because the artists liked to use found pieces of unfinished wood or re-cycled lithographic stones, Brücke prints often have irregular shapes, which accentuate their experimental, untamed rawness. Heckel excelled in the printmaking medium, and his woodcuts are especially revered for their strong planes and simplified, expressive lines. 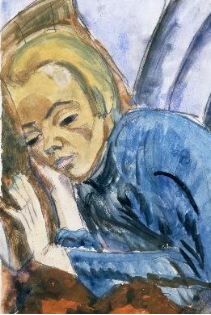 With the exception of Pechstein, who was a painter by training, all the Brücke artists were self-taught and closely studied the techniques used by fellow artists for inspiration. Edvard Munch’s pioneering “jigsaw puzzle” technique, in which a woodblock was sawn into pieces, inked separately (either by roller or brush) and then fit back together, proved particularly influential. Heckel was an especially prolific printmaker, known especially for his luminous woodcuts. The Dube catalogue raisonné describes 465 woodcuts, 375 etchings and 400 lithographs. Most were executed between 1905-23. (Heckel’s graphic output declined in the 20’s but resumed after WWII.) Since print-making was his preferred medium, Heckel was often charged with creating the posters and invitations publicizing Die Brücke’s myriad exhibitions. After forming Die Brücke, Heckel ceased his studies and instead began to work in the architectural offices of Wilhelm Kreis. Eminently practical, Heckel took over the management of Die Brücke and engaged himself in organizational duties, serving as Treasurer and Secretary. He also became the unofficial mediator of disputes between group members. From the outset, Die Brücke was extraordinarily successful. After their first exhibition in 1906 in the show-room of a Dresden lamp factory, the group won access to the city’s leading modern art galleries, and they exhibited every year thereafter. Frequent collaboration between the members, who often worked in pairs, yielded such extreme similarities in style that it was often difficult to tell one artist’s work from another. The period between 1909 and1911 saw the height of this communal development. In a nod to the Gesamtkunstwerk (total artwork) ideal forged a decade earlier by Austrian artists, Heckel and Kirchner, frequent colalborators, decorated their studios with murals, furniture and sculptures they crafted themselves. By 1911, the members of Die Brücke had all relocated to Berlin, completing an exodus begun three years earlier by Pechstein. The move precipitated a change in the group’s development, and from this period on each artist began developing a more individual style. Heckel’s colors became more subdued, his work more melancholy. He introduced the motif of the thoughtful, brooding or sick person, lying in bed, and increasingly took up literary illustration. The mask-like features that appear in Heckel’s portraits at this time reflect his new proximity to Berlin’s ethnographic museum, a source of inspiration for many of the contemporary artists. 1912 brought the artistic peak of Heckel’s work, culminating in his inclusion in the Sonderbund show in Cologne and, along with Kirchner, the decoration of a nearby chapel. After seeing a Futurist exhibition in April 1912, Heckel intensified his angular style. During this prolific period, Heckel met Wilhelm Lehmbruck, Christian Rohlfs, Lyonel Feininger, Franz Marc and August Macke. Together, the Die Brücke artists exhibited their work in almost 20 shows. Despite its success, however, Die Brücke disbanded in 1913 due to infighting and disagreement among the members. Shortly thereafter, Heckel had his first one-man show at the Galerie Gurlitt in Berlin. Although Heckel volunteered for service in World World I the following year, he was deemed unfit to serve and instead worked, along with other artists, as a medic in Flanders. His position allowed him and the others in his unit to continue to produce art. Heckel captured his war experiences in drawings, sketches and, incredibly, a number of graphic works, including a group of gripping self-portrait woodcuts. He married Milda Frieda Georgi in 1916, and after the end of the War became an active member of the political artists’ advisory board, Arbeitsrat für Kunst, as well as the Novembergruppe. He also traveled a great deal. Mountains, particularly the Alps around Lake Constance and the Black Forest, interested Heckel intensely. Their monumentality and grandeur are captured in many of his landscapes and for a time figured prominently in his work. In 1936, Heckel’s work was declared “degenerate,” and over 700 of his pieces were confiscated and expelled from German museums. An air raid, which struck shortly before the end of the war, destroyed his Berlin studio along with all of his print blocks, plates and many of his artworks. Heckel later moved to Lake Constance and took up graphics again, but these works were never considered as desirable as his earlier woodcuts. After World War II, he was honored as one of Germany’s most important artists. He received many exhibitions and awards throughout the remainder of his life, including a 70th birthday celebration in 1953 that included shows in numerous German cities. In 1949, Heckel was appointed professor at the Akademie der Bildenden Künste in Karlsruhe, a post he held until 1955. He died on January 27, 1970.